← No turtles were harmed during this post. Water Temp – 54.8 deg F! Six Anesthesia residents, twelve + beers, some pipe tobacco, a pleasantly plump white lab, and a host of spinning rods and fly tackle set off on a long walk Saturday afternoon after our big test. Our bellies were recently stuffed with hamburgers, grilled chicken, mac and cheese, and taco salad. We were looking to return the favor to our bass friends a la poppers and fake worms. Our destination will need to remain top secret, but it was a long hike in the woods to get there. Those are always the best fishing locations as most people aren’t willing to put forth the effort beyond driving the truck and parking. Matt discovered this place a year ago while out running with his aforementioned dog. (She was recently diagnosed with a thyroid condition) The dam on one end is clearly home to a happy beaver family. There are signs of neatly gnawed trees dotting the approach to the pond’s edge. The weather was perfect. Even more exciting, the thermometer read 54.8 degrees in the water. Matt and I rigged up with fly rods while Lola splashed around the inflow stream and shallows. Two of us brought some spinning tackle, for more on Rob’s thoughts about spinning tackle see this. Harry Murray swears by the Carolina blue popper. 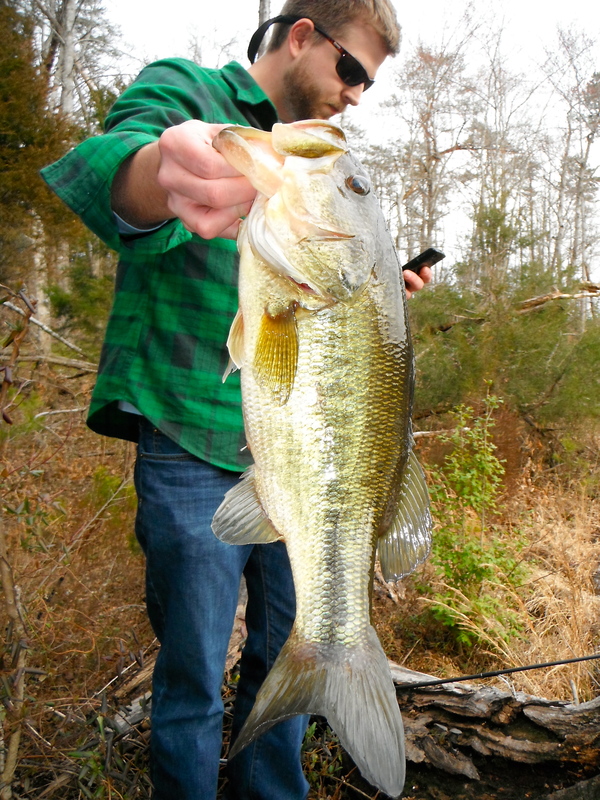 Early season poppers require some patience. I had my success in the seconds long pause after each short strip. 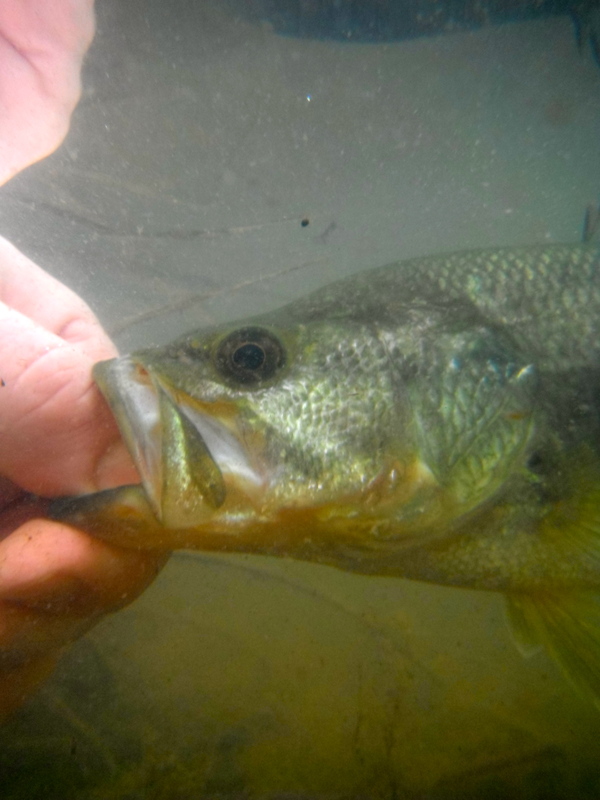 In a podcast on largemouth bass fishing, Tom Rosenbauer suggests that in the early spawning season you should pause for up to ten seconds after each strip to allow the bass to fully examine the fly. The strikes are not subtle and often come on the tail end of such a long pause. Both of my fish paled in comparison to Jared’s toad monster, but they were caught in the shallows around a submerged log. I think with the water temperatures being above 53, and the fact that I caught some largemouth in the shallows on surface bugs signals the beginning of the largemouth spawn. Check another sign of spring off our ever increasing list. First daffodils, crocuses, and cherry blossoms, now eager, angry, hungry bass lurking in the shallows. Jared’s fish was the catch of the day. This pond’s edge was perfectly suited to spin casting. Jared tied on a heavily weighted hook and attached a “wiggly worm” imitation on the end. 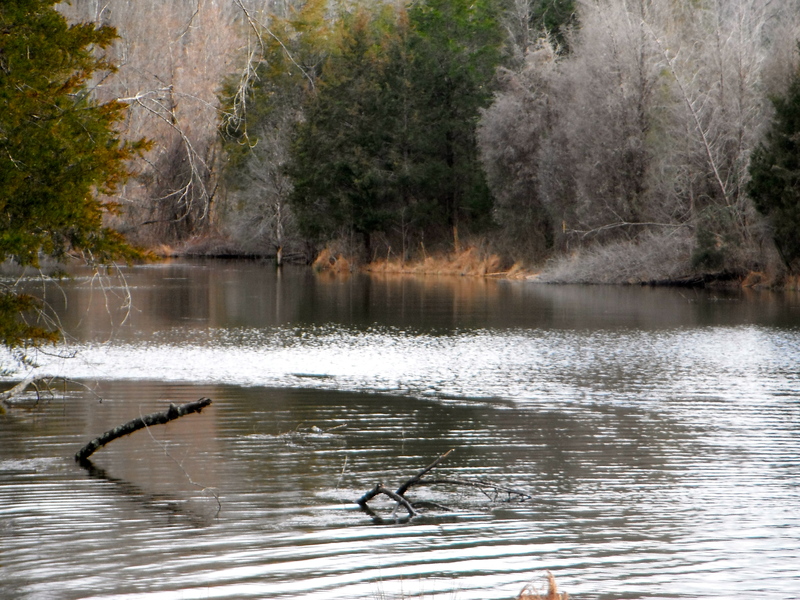 He cast it clear across the pond to an area undisturbed by Lola but clearly dotted with signs of underwater structure. His first few casts resulted in a couple missed strikes and a few snags, but soon he was screaming the familiar redneck cry…FISH ON!!! I tried poorly to get some underwater pictures of this hoss. None of us had waders and I didn’t want to risk losing another “smartphone” in a tragic bass fishing accident. Kudos to Jared and a special shout-out to Kevin who fumbled around with one of the spinning rods for the better part of an hour before angrily tossing the tangled mess of monofilament to the ground in a string of curse words. Importantly, he didn’t spill his beer. 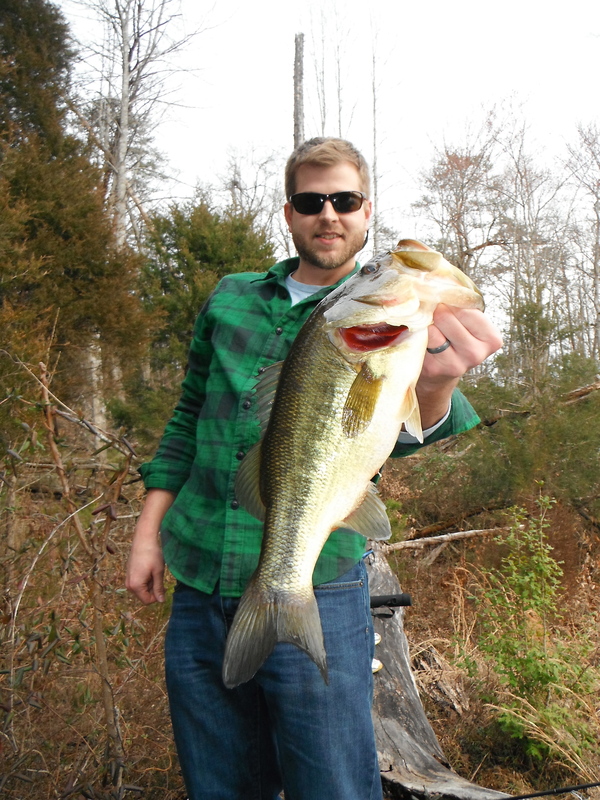 This entry was posted in Fishing Report and tagged anesthesia residents, bass, beaver pond, fishing report, Fly fishing, largemouth, largemouth bass spawn, spin casting, Virginia. Bookmark the permalink. Where is a picture of Lola? THat’s a funny looking trout! They call them Green Trout in Louisiana you know. Me, I can’t walk but I went fishing anyway. Caught two yesterday and lost 4, two monsters cause I could not chase them. Waded only on flat bottom, slowly, with a stick. Today I caught 3 on dries but it was 35 degrees when I left. It must be nice to have 55 degrees! I did not fall down. I had no beers, I had no McCallan… but I did not fall down. I broke in the Sage One 3 weight. Andy your images are looking great. Keep up the good work, you’re becoming a regular Ansel Adams.